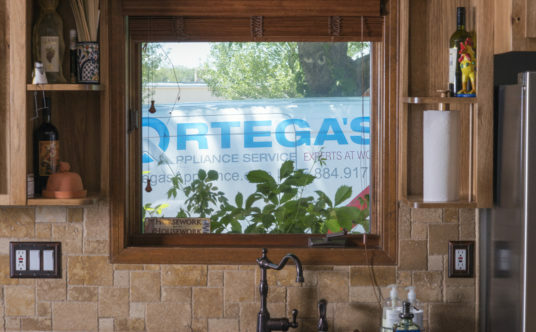 Ortega’s Appliance Service proudly provides convenient Albuquerque & Santa Fe refrigerator repair, which Albuquerque homeowners know and trust. Our award-winning service is fast, friendly, and dependable. We know how troublesome a faulty device can be. A broken refrigerator is a substantial problem that affects your entire family. If your refrigerator isn’t running properly, call Ortega’s and one of our expert technicians will happily help you schedule repairs. We provide refrigerator repair in Albuquerque, Santa Fe, Bernalillo, Rio Rancho, Corrales, and more! We proudly repair all major residential refrigerator brands including Sub-Zero, Viking, Bosch, Dacor, Electrolux, Frigidaire, Gaggenau, GE, Hot Point, Haier, Scotsman, Thermador, Westinghouse, and more! See our full list of brands we service here. Ortega’s understands that the only thing more inconvenient than a malfunctioning refrigerator is waiting for days before it’s repaired. You need a service provider that will get your appliance back to working order as fast and affordable as possible. Not only are our friendly staff members waiting to take your call, all of our customers can quickly schedule appliance service and repair appointments at Ortega’s Refrigerator repair Albuquerque’s website. Simply fill out a form detailing the type of service needed on the date that fits your schedule and one of our expert technicians will resolve all of your appliance problems. Why do homeowners trust Ortega’s refrigerator repair Santa Fe Services? Since 1975, we’ve been committed to delivering the best customer service and the finest appliance repair to each and every one of our customers. Our knowledgeable technicians are expertly trained for 9 major home appliance lines as well as 25 additional brands. We pre-diagnose every service request before arriving at your home so that we can do our best to solve your issue within a single visit. Now, we’re happy to announce that Ortega’s Appliance Service will be bringing our award-winning service to the Santa Fe area! After 40 years of dedicated service to the families of Albuquerque, we’re excited to extend our service area to Santa Fe. We’re grateful for all of the loyalty our customers have shown us and are eager to help more homeowners in New Mexico with all of their appliance needs. Refrigerator repair Albuquerque and Santa Fe residents depend on is only available from Ortega’s Appliance Services.